A fun activity for your kids to try while waiting at a restaurant is Restaurant Bingo. No one likes waiting for food when they’re hungry so help the time pass by while playing this free printable Restaurant Bingo game. How do you pass the time while waiting in a restaurant? Do you stack up towers of creamers? Pick out what types of desserts you’d like to try if you’re not too full after dinner. Chat about what’s new or exciting in your life? Catch up on emails or homework? You can play this game again and again at different restaurants since each restaurant layout will be different. Be sure to pack a few in the car so you always have one on hand. To play the game, simply look around the restaurant and cross off the items you find. You could even print two games – perhaps one side of the table could play against the other. You know what a great prize for the game would be? A great big dessert! 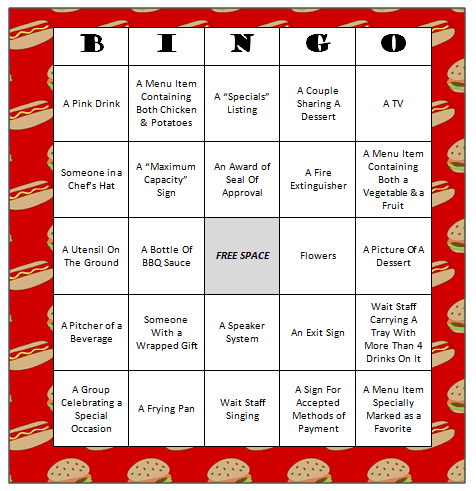 What items would you add to a restaurant bingo game? Have you ever witnessed anything “out of the ordinary” while at a restaurant? For more fun & free printable games, check out our Printable Games Page. We have word searches, BINGO games, scavenger hunts, word scrambles, charades and more! If you have a suggestion for a game you’d like to see, feel free to let me know and I’ll try to help you out. I love requests from readers! We’re always added new activities to enjoy with your family. Stay updated on the latest ideas by joining our communities on Facebook, Twitter and Pinterest or following the RSS feed on Bloglovin’. We look forward to seeing you there!